It's written in the stars! 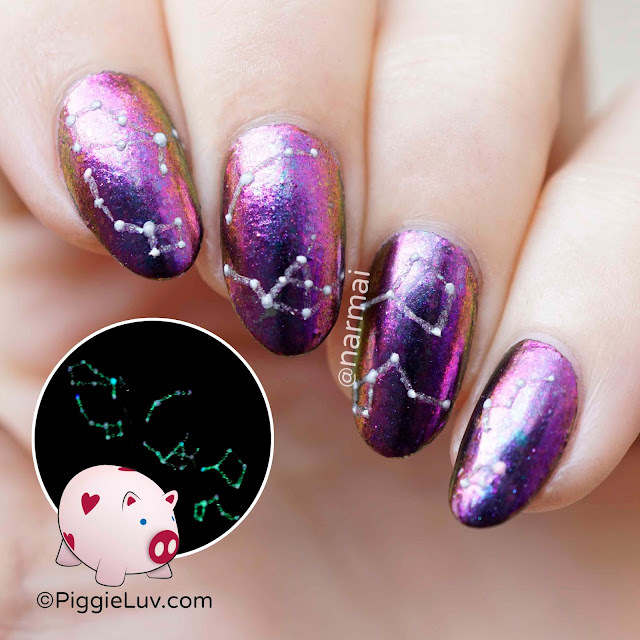 Which constellations can you recognize in this nail art design? LOOK at that shift!!! The base is made with Galaxy Flakies from What's Up Nails and they are gorgeous!! There is *one* downside to this product and that is that the flakies fly everywhere. And then get stuck on stuff. It makes a mess but at least the mess is pretty! Aaaaand you can look at the stars in your bed even from under the blankets! I painted the stars with Serum No. 5 Guiding Light, and added the constellations with Budding Lights. The constellations were supposed to be invisible, and then glow when the lights went out, but... sometimes stuff just doesn't work exactly the way you envision it! I received Galaxy flakies from What's Up Nails as a press sample. Opinions expressed are 100% my own and not influenced in any way other than the quality of the product itself.